What did I do right? Also, to pot or not? One is about the cactus in the foreground. I´ve got literally dozens of these cacti, all from the one plant I got too many years ago to remember and not a single one has ever flowered...until this October when one of the biggest ones suddenly burst into bloom. As with all my succulents, they spend the summer on my patio where they get sun in the morning, and are brought indoors in autumn. I can´t think of anything I´ve done differently this year to cause this unexpected phenomenon! So is it sheer coincidence that this particular specimen decided to surprise me this year or did I really do something right? My other question concerns the small orange-headed cactus in the background, which I assume is a composite of two plants, and which has lots of little plantlets clinging to it. If I remove them and give them their own pot, is there the chance that they´ll survive and, if so, how should I care for them? Comments for What did I do right? Also, to pot or not? Hi Helen, what you did was be patient. 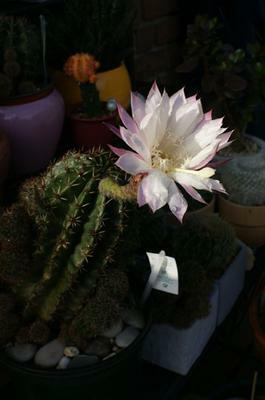 Often, especially with succulents, plants won't bloom until they're big enough, and also root bound. The plant knows best, and they will only bloom once there is a bit of stress, such as the roots reaching the sides of the pot, a bit of drought, or something else triggers the flowering cycle. Now it's up to you to copy that trigger, and get it to happen again. I have the best success getting cactus to bloom by making them thirsty, sometimes for a year or more - which means no water at all, to the point that they shrivel. Then resume watering them. The trick is to find out when their normal flowering season is, in their native habitat, and try to follow that. The orange cactus you're referring to is a grafted plant, which means that the orange part doesn't have any chlorophyl, an essential ingredient for the plant to survive. That's why it's grafted onto the green plant. You don't say which part is the part that's got the pups, but if it's the green part this will be some type of really common not-very-interesting plant. If it's the orange part, they won't survive. Sorry. You can separate the pups (if the green part) and grow them in their own pot if you want to try an experiment. Just pull them off and set them on the top of some cactus soil until they root. Thank you so much for your help. What you said about the size of the plant made me compare them all and the one that bloomed is the biggest so probably the mother of all of them. At present it's (I almost wrote "she's") laden down with another 2 dozen babies which may contribute to the stress factor! It's amazing it had enough strength to produce a flower too. Normally, in the wild, the orange (and other colors) cactus would never survive, but obviously, with our help, the mutants can live and grow.